Paignton Zoo has just bred a rare and unusual lizard for the very first time. The Solomon Islands skink is also known as the prehensile-tailed skink, or the monkey-tailed skink… or the giant skink… or the monkey skink… or even the zebra skink Whatever you call it, this is one extraordinary creature. For a start, it’s the world’s largest skink. A skink is a type of lizard – the word is from the Greek and referred originally to lizards in that part of the world. It’s one of the few reptiles known to live in a social group (called a circulus). It gives birth rather than lays eggs – that’s also unusual. And females are fiercely protective of their babies, which is a rare trait in reptiles. Like snakes, the skink smells by flicking out its tongue. They are territorial, herbivorous and live in trees – which is why deforestation is such a concern. Curator of Lower Vertebrates and Invertebrates Luke Harding: “Logging is a serious threat to this species. Skinks are also caught for food and the pet trade. They now have protection under CITES appendix II. The Solomon Islands skink (Corucia zebrata) comes from the Solomon Islands archipelago in the South Pacific. 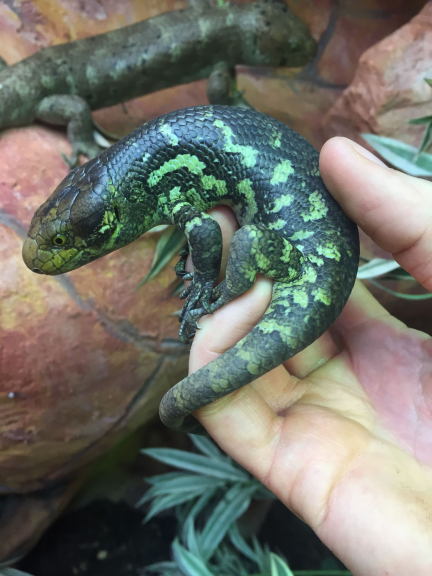 Youngsters will stay in their groups for a year or more, protected not only by their parents but by other unrelated adult skinks, too. They can live for twenty-five to thirty years. Paignton Zoo is home to four adults, all six or seven years old. Mother and baby, along with the other adults, can be seen in Reptile Tropics. Paignton Zoo Environmental Park is a registered charity. For more information go towww.paigntonzoo.org.uk or ring 01803 697500.